Last week I was having lunch with my mom at our favorite nearby nursery/café. After failing to resist the grilled cheese sandwich (3 cheeses! And buttery panini bread! ), we walked off lunch in the garden supply part of the nursery. Normally I’m on my best behavior when I’m shopping with my mom (i.e. I don’t take photos of things I’m going to take to task on the blog). 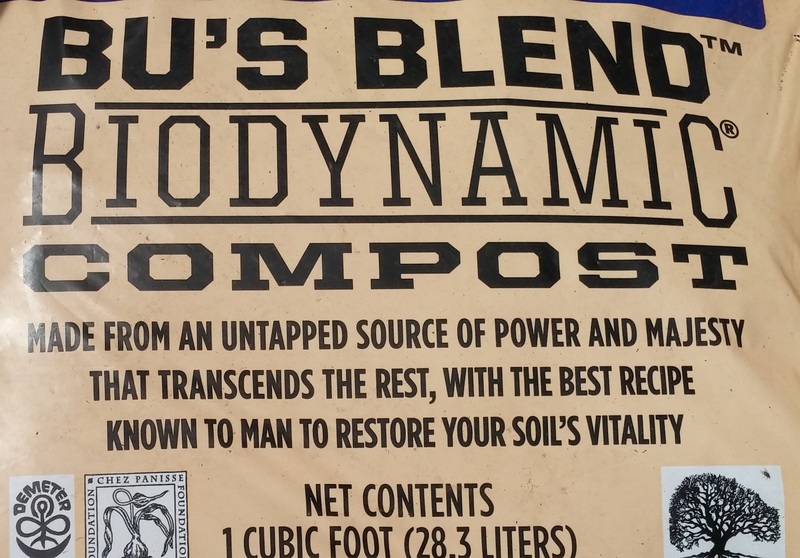 But like the 3-cheese grilled sandwich I was unable to resist the bags of biodynamic compost. Long-time readers of the blog may remember my earlier column and post on biodynamics. Since I wrote the original column over 10 years ago I’ve watched biodynamic marketing move from boutique wines to coffee, tea, tomato sauce…and now to garden products. Really expensive garden products, as in $19.99 for one cubic foot of compost. 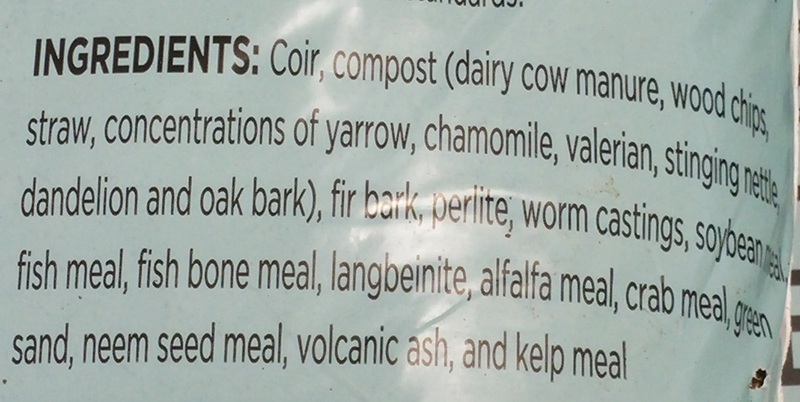 An “untapped source of power and majesty” makes this compost different. What makes this bag of compost worth $19.99? One has to assume it’s the biodynamic preparations used to treat the compost. They’re referred to in the label under “concentrations of yarrow” and so on. Do these preparations make a difference? The label suggests it might be to restore the soil’s vitality. Is there validity to this claim? It’s doubtful that all of these ingredients are locally available. And why are so many materials needed? Don’t let packaging and magical words sway you. Compost made with local materials like bark or agricultural wastes and certified by the US Composting Council is reasonably priced and sustainable. We had a question on the Facebook site regarding fall fertilization of landscape plants. Fertilization in general, and fall fertilization in particular, is a complex topic and needs a little more room for explanation than the Facebook discussion allows. As a general rule, most landscape trees and shrubs can maintain acceptable growth and appearance without fertilization. There are a couple of reasons for this. As Linda noted in the Facebook discussion, woody plants are fairly efficient at internal nutrient recycling. I’ve done a couple of studies where we sampled leaves of hardwood trees during the season and then re-sampled right after senescence and about 50% of leaf nitrogen is re-absorbed by trees before they fall. Conifers are even more efficient at conserving nutrients than hardwoods since they typically only lose 1/4th of their needles (or less) each year. In addition, many landscape trees are able to utilize fertilizer that is applied to surrounding turf. On the flip-side, nutrients that occur in litterfall are removed from the nutrient cycle in many suburban landscapes and this may eventually contribute to deficiencies. Bottomline, landscape fertilization should be based on need; which can be assessed based on soil sampling, foliar sampling, or visible symptoms. At least two of the three methods should be employed to make a diagnosis. Each method has drawbacks and visible symptoms are usually the least useful since many nutrient deficiencies have similar symptoms or the symptoms may not be nutrient-related at all. 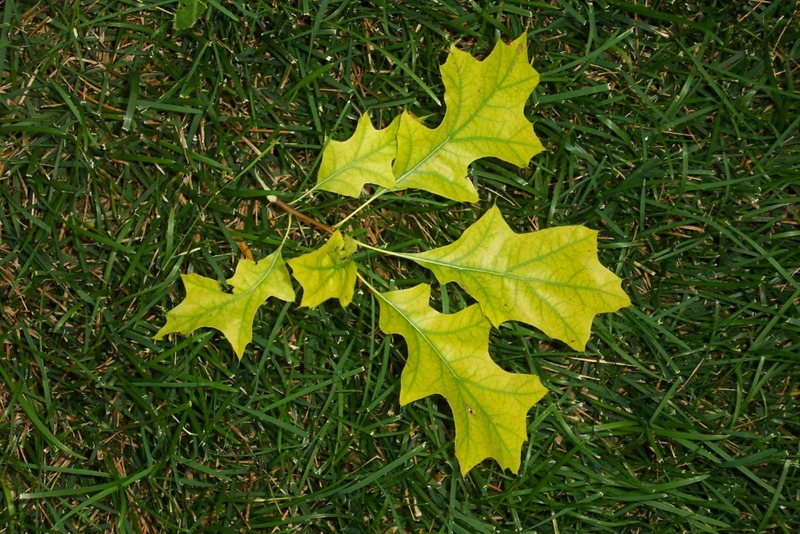 In our area the only nutrient problems I am comfortable diagnosing based on visible symptoms are iron chlorosis in pin oaks and manganese deficiencies in red maples, both of which are induced by alkaline soils, not a lack of those particular elements. So assuming we’ve established that fertilization is needed, what about fall fertilization? There are a couple of arguments that are usually brought forth for fall fertilization. One is that trees can absorb nutrients during the fall and then use them for spring growth. This is generally true provided that soils are warm enough to allow continued root growth and absorption. Another argument is that fall-applied fertilizer that is not taken up by roots in the fall be will available for uptake when soils warm again in the spring. A third, and less scientific reason, is that fall is often a slow time for arborists and landscape companies and fall fertilization is an easy service to add to their sales program. There are a couple of objections that are usually raised to fall fertilization. One is that nutrients will leach through the soil over winter before they can be absorbed. This is one of those ‘it depends’ scenarios. If a nitrate-based fertilizer source is used, this is possible since negatively-charged nitrate anions won’t bind to negatively-charged cation exchange sites in the soil. If the nutrient source is urea or ammonium-based, the amount lost will be dependent on temperature since this will drive the conversion from ammonium, which can bind to cation exchange sites, to leachable nitrate. The other usual objection to fertilizing trees in the fall is that it will reduce cold hardiness. There is no clear evidence to support this, however. Harold Pellett and John Carter at the University of Minnesota compiled dozens of studies on the effects fertilizer on plant cold hardiness (Horticultural Reviews 3:144-171). 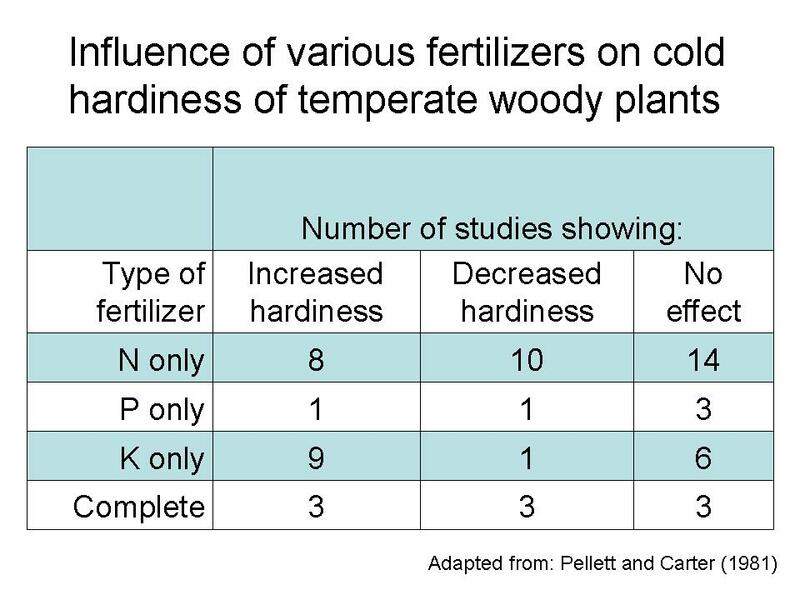 For conifers and temperature hardwoods they found no clear trend across studies, except that fertilizing with potassium improved cold hardiness is most cases (see table). The common perception that fall fertilization, especially with N, will increase cold damage probably stems from studies of fertilization of turf, which had negative impacts in 26 out of 29 studies cited by Pellett and Carter. In summary, landscape trees and shrubs should be fertilized only where there is a demonstrated need. Fall is a good time to fertilize provided you avoid nitrate-N sources that will be prone to leaching. Posted on September 22, 2014 Author Bert CreggCategories Bert Cregg, UncategorizedTags fertilizer, nutrients7 Comments on What about fall fertilization? Boy oh boy, what a fun day! People yelling at me from the left and from the right. But hey, I didn’t start doing what I do to make everyone happy. With that said….Nah, I don’t feel like attacking anyone today. Instead, let’s look at a good renewable fertilizer: Cotton seed meal. It’s got a reasonably good ratio of nitrogen to phosphorus and potassium — slow release of course. Basically a waste product given a meaningful purpose. And look at the label — no mycorrhizae or other gimmicks. Just pure, unadulterated, cotton seed meal. This is what I want on my garden. Does fertilization increase insect herbivores? Always fun when you find a research paper that confirms what you’ve suspected all along. I ran across a paper last week in the Annals of Applied Biology entitled ‘Fertilisers and insect herbivores: a meta-analysis’ (Butler et al. 2012. Ann Appl Biol 161: 223–233). I’m interested in the topic because in recent years a dogma has emerged that if you fertilize a landscape tree it will be immediately devoured by insects. In this study the authors conducted a meta-analysis (basically a compilation of studies on a given topic and then combining and analyzing the aggregated results) and looked at dozens of studies of the response of insect herbivores to fertilization to answer the question, does fertilization increase insect damage? The answer was absolutely no surprise to me: It depends. What does it depend on? First, what type of insect. Secondly, what kind of fertilizer. For example, fertilizing with nitrogen greatly increases populations of sucking insects. This makes sense when you stop to think that aphids and other sucking insects have to consume a lot of phloem sap –which is essentially sugar water – in order to get sufficient nutrients. Nitrogen fertilization did not significantly increase populations of chewing insects, however. This could be related to off-setting effects of improved nutritional quality of leaves versus increased presence of defense compounds or leaf toughness. For other fertilizer elements Butler et al. found that phosphorus decreased insect populations in 2/3rd of the studies (14 out of 21) and that potassium decreased insects in 7 out of 10 cases. As with nitrogen only, complete fertilizers (NPK) tended to increase insect populations, especially for sucking insects. I should hasten to point out some limitations of the study as it relates to tree fertilization. First, of course, is the British spelling of fertilizer. Second, the study mainly dealt with fertilization in agronomic crops, not trees. Lastly, the authors only included studies on insect adults. In many cases insect larvae, not adults, are the most damaging life stage, especially for insects that affect trees. Nevertheless, the study highlights the difficulty of making generalizations when discussing host stress and insect interactions. In addition to type of insect and type of fertilizer, we could have added nutritional status of the plant before fertilization to the ‘It depends’ list. My rule of thumb is that trees shouldn’t be fertilized unless a problems is noted by visible symptoms, a soil test, and/or a foliar test – and preferably by more than one of these. Bottom line: Before you buy into the notion that fertilizing a tree is going to increase insect problems make sure you know what type of pest you’re dealing with, what type of fertilizer and the current nutrient status of the tree. Posted on December 3, 2012 Author Bert CreggCategories UncategorizedTags fertilizer, insects10 Comments on Does fertilization increase insect herbivores? 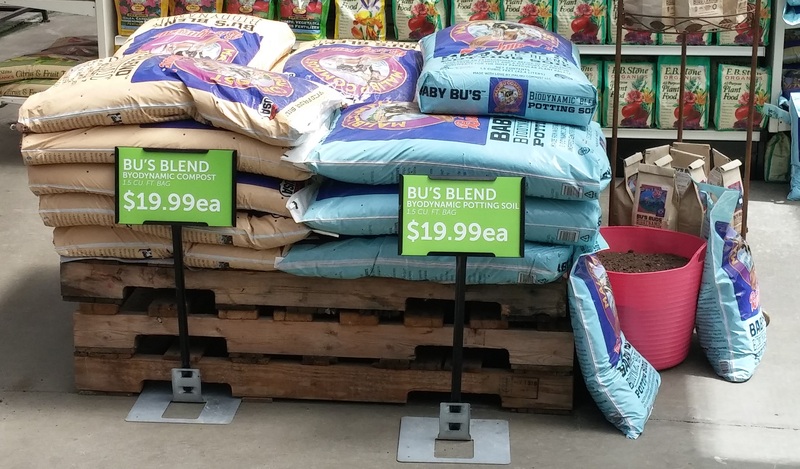 As I was looking over the label on a bag of fertilizer this morning I was reminded of the time, a few years ago, when a friend of mine and I went to a local K-mart and decided to see what the people in the gardening section knew. We started small—we went over to a bag of fertilizer and my friend asked what the three numbers on the bag meant. 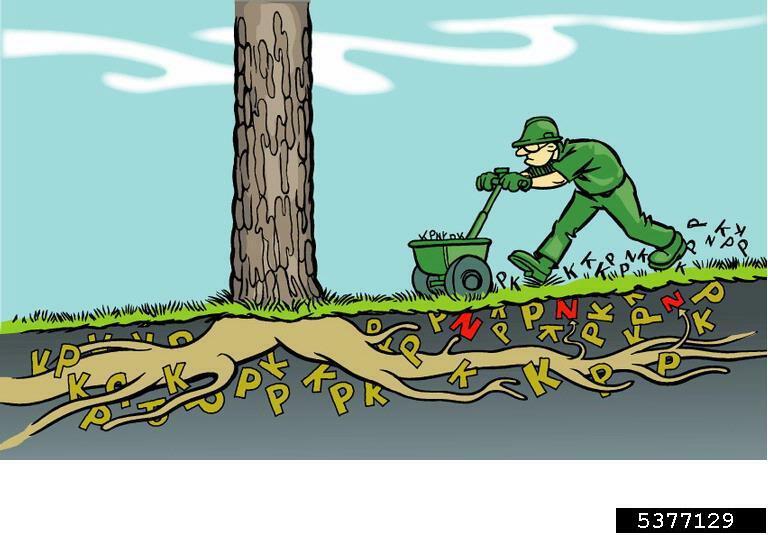 Now, as most gardeners know, those numbers indicate the amount of nitrogen, phosphorus and potassium in the fertilizer. Unfortunately the guy we asked told us that those numbers were actually a computer code…We never did find out exactly what this computer code was for. I have no idea why the guy couldn’t just say “I don’t know”. We had intended to ask more questions, but both of us were too stupefied to continue. So I have a challenge for all of you this weekend—I’m curious to see who takes it up—go to a box store, or a garden center—your choice—and ask them what the three numbers on the bag of fertilizer are for. You can list responses in the comments section below—or feel free to e-mail me directly at gillm003@umn.edu if the answers are too embarrassing! It’s the start of new semester. Best way to get student’s attention is with a pop quiz right off the bat! So in that vein, we’ll cross things up and give a quiz on Monday instead Friday. Relax; to make things a little easier we’ll make this one a matching exercise. Since Chal has yet to publish this I need to be a little careful with details but all fertilizers were commercially available products labeled and marketed for this purpose and were applied at manufacturers’ suggested rates and intervals. At the end of the growing season, the trees were sampled for needle nitrogen content. As a point of reference a needle nitrogen content of 1.5 – 1.6 % is usually deemed adequate for this species. Posted on September 12, 2011 Author Bert CreggCategories UncategorizedTags fertilizer, woody5 Comments on Pop quiz time! Grading finals, looking at roots, and planting seeds is consuming my time this spring, but I have just a few things to share today which might be interesting. So, as those of you who follow this blog know, I love peanuts. This year we’re planting out a bunch of new varieties, a few of which are extremely interesting. Believe it or not there are not only red and pink peanuts but also black, white, and mottled peanuts. We have these on order — when they come in I’ll post a picture. When we introduce Minnesota Boiled Peanuts at the State Fair in a few years (that’s the goal anyway) the plan is to introduce a wide variety of really unique looking peanuts. Fingers crossed they can live here! Here, at the University of Minnesota, we do a really great job of telling people that, when they fertilize their grass, they should keep the fertilizer on the grass and not on the sidewalk — SO WHY CAN’T THE UNIVERSITY TEACH THE KIDS WHO APPLY THE FERTILIZER TO THE UNIVERSITY’S LAWNS TO KEEP THE DARN FERTILIZER OFF OF THE PAVEMENT?!? Last week as I walked in I heard a crunching sound coming from my feet. When I looked down there was a little pile of fertilizer on the sidewalk. Believe it or not, judiciously fertilizing your grass actually helps prevent fertilizer run-off. That’s because grass with a weak root system (as occurs in the typical lawn when you don’t fertilize at all) won’t be able to hold the soil as well — so you get more erosion. So do fertilize your lawn, just don’t go nuts. About that whole tree in the lung thing which I posted last week? Yeah — It’s BS. How do we know it’s BS? No obvious roots on the tree and the tree’s needles were green (you don’t get green plants without sunlight). Personally I think this is some kind of odd cry for attention, but I guess it’s possible that the guy swallowed a cutting while he was shearing/pruning trees. HOWEVER, there are documented cases where seeds will germinate in a persons lung — Usually the person has a compromised immune system.